Two years back, no one had estimated the growth of smartphones in India to be so rapid. The industry grew so fast that now we have twenty alternatives in one small segment, and more and more companies are coming up. 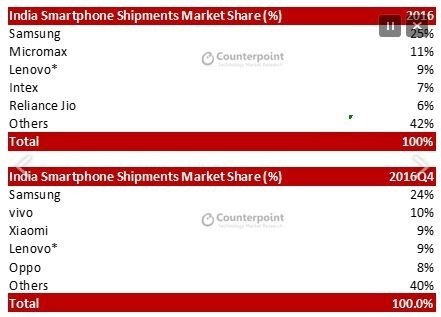 As the Chinese smartphone players dominate the industry, Samsung still keeps the top spot in absolute shipments. As of 2016, India has surpassed the 300 million smartphone user count, almost one eighth of the global count. This is quite a huge feat, considering the penetration of smartphones in India is mostly limited to the cities. According to a report by Counterpoint Technology Market Research, the smartphone shipments in India grew a healthy 18% annually in CY 2016 compared to the global smartphone market which grew a modest 3%. The Chinese smartphone players have taken over the shipments in the later half of the year, comprising of a huge 46% now, as opposed to 14% same time last year. Micromax has been struggling with its sales, and has been seeing a regular decline in shipments. Overall mobile phone shipments declined 17% QoQ during Q4 2016, which could be blamed on demonetization, causing slower growth. Feature phones, on the other hand, grew a little over 4% YoY as a few players introduced inexpensive phones in the later half of the year. More than 83 million smartphones in 2016 were “Made in India”. In Q4 2016, 3 out of 4 smartphones were manufactured domestically. This is a growing testament to ‘Make in India’ initiative taken by the present government. Apple achieved a big feat by crossing 2.5 million units in a calendar year, with a third of its total shipment coming alone from the record fourth quarter driven by seasonality and the launch of iPhone 7. Apple figures in the best premium smartphone maker category in India and continues to hold this title, with 62% market share. Overall, however, Apple came at the 10th place in the smartphone rankings in the fourth quarter of 2016. Samsung continues to be the overall kind, with 25% market share in 2016, and 24% in the fourth quarter. I am sure these statistics would have looked better had the Galaxy Note 7 fiasco not happened. Micromax was ranked second in 2016, at 11% market share. 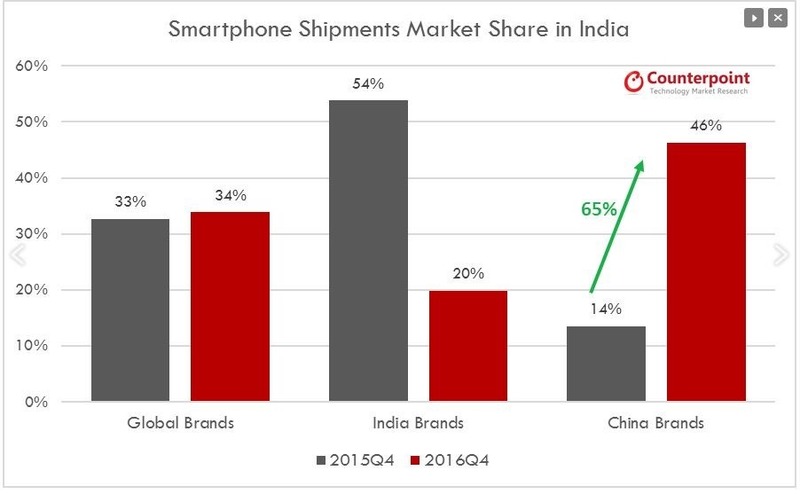 While Indian brands captured 54% of the share in Q4 2015, this share fell to 20% in Q4 2016, which is not very shocking but something for Indian smartphone makers to think about. Chinese companies dominate the market! Chinese brands like Oppo, Vivo, Lenovo(Including Motorola) and Xiaomi continued to grow at the expense of Samsung and Indian brands. These companies have ventured into online and offline retail with so much aggression that it is hard to ignore them. The shipments of these smartphones grew from 14% in Q4 2015 to 46% in Q4 2016. Specifically November 2016 saw a huge increase in this share to around 51%. No Indian smartphone maker makes it to the top 5 list in the fourth quarter. Even though Reliance Jio’s LYF smartphone range has given a push to Indian smartphone makers, it is not enough to surpass the Chinese manufacturers. These companies has taken cognizance of the fact that India, like China, is a huge growing market and has similar needs. As the Chinese companies get more aggressive, the market share will soon start shifting towards them. We can expect almost 60-70% of the shipments from these Chinese players, while Indian manufacturers will see a strong dip. Jio’s LYF phones are the only hope, as Micromax and Intex struggle with their sales. Samsung will continue to be the leader in India, and with the new Samsung Galaxy S8 and Note 8 lined this year, along with the A and J series budget smartphones, consumers will continue to rely on the Korean giant for value-for-money smartphones. "Chinese Smartphone Brands Rout Indian brands; Smartphone Userbase Crosses 300M in 2016: Report", 5 out of 5 based on 1 ratings. Google Rolls Out Automated ‘Instant Tethering’ For Android Devices to Be Always-Online! 4 Major Changes Which Transformed Indian Smartphone Market In 2016! Apple’s India Plan: Sell Used, Refurbished iPhones From China to Indians! Why do you guys behave like Modi ? iPhone,Riliance Jio may seem to be two different brands but both these mobile phones are manufactured by FoxConn which is a chinese manufacturer and you guys know very well.Whether a person buy IPhone or Rialiance Jio the phones are still Chinese.And Micromax mobile is also made in china.